All original 60's vintage MOD shift dress. Navy blue with cream wool, navy rayon lining. Two tone, color block shift. 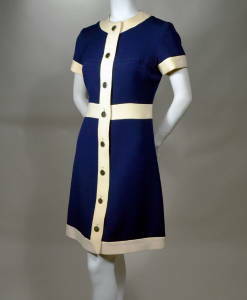 Navy dress with cream banding at neckline, cuffs, button placket, waist and hem. Jewel neckline, applied neck ring. Welted seam across bust. Button front, applied placket. Chrome shank buttons (8) with bound button holes. Short sleeves, applied cuffs. Inset contrasting waistband. Applied contrasting hem. Full rayon lining. A Courreges inspiration... Seriously MOD! Center back length, measured from neckline seam to hem edge - 36"
Excellent condition. Shows only the faintest little mark between #3 & 4 buttons... completely minor.